We have information you must know before you buy the Q8. 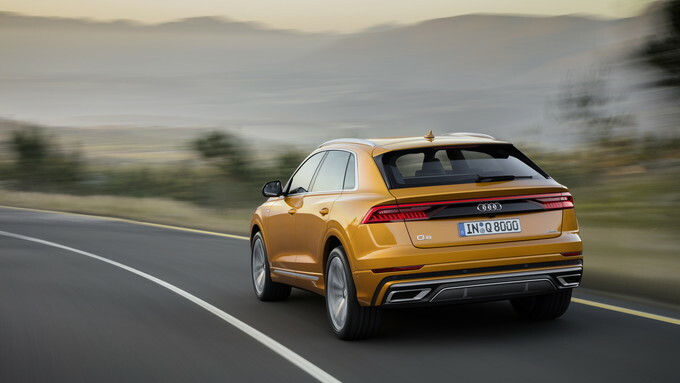 The 2019 Audi Q8 is an all-new two-row SUV with seating for five and a twin-scroll V6 with mild hybrid technology. It’s positioned about $11,000 higher in price compared to a comparably-equipped Q7. Current offers from Audi are limited, but that may change when current incentives expire on April 30, 2019. Audi has not yet announced any standard discounts on the new Q8. However, current Audi customers with a 2009 or newer Audi vehicle can get a $750 loyalty credit, customers who own or lease a competing brand can get a $3,000 credit, and anyone who leases a new Q8 Premium through Audi Financial Services (AFS) this month can receive $2,000 lease cash. The 2019 Audi Q8 is eligible for the brand's standard rate of 3.99% APR for 66 months. As mentioned above, Audi Financial Services is offering a $2,000 bonus on new leasing of Q8 Premium trims, which is the best lease offer to date on this model. The manufacturer has yet to introduce promotional lease rates on any Q8 trim. Crossovers and SUVs continue to be the hottest vehicles on the market, which has automakers expanding their lineups with new offerings. 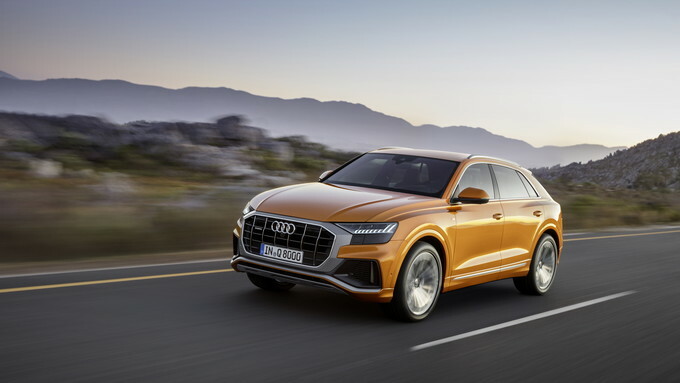 The 2019 Audi Q8 is the German brand's latest addition, slotting in above the large Q7, as the range-topping model in the SUV family. Wider and lower than the Q7, the Q8 puts style first with its coupe-like lines and modern design. As an all-new model, the Q8 ushers in a new era of stylish and sporty SUVs for Audi. 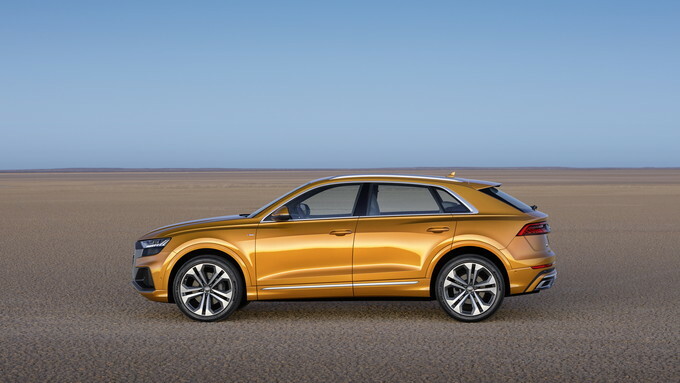 The Audi Q8 is an all-new vehicle for the 2019 model year. With its sporty styling, the Q8 is clearly a performance-oriented vehicle. With that in mind, it's not a surprise to hear that the vehicle is only available with a turbocharged 3.0-liter V6 that's rated to make 335 horsepower and 369 pound-feet of torque. The engine is paired with an eight-speed automatic transmission. In typical Audi fashion, the Q8 has an all-wheel-drive system as standard, which utilizes a mechanical center differential, allowing for a 40/60 torque split front to back. Thanks to the punchy engine, quick-shifting transmission, and quattro all-wheel-drive system, the Q8 can get to 60 mph in just 5.6 seconds. And when properly equipped, it can tow up to 7,700 pounds. An adaptive air suspension system helps the Q8 get through inclement weather and makes loading cargo easier with just the touch of a button. All-wheel steering is also available, making the Q8 easier to drive at low speeds. The Q8 may sit above the Q7, but its athletic body style eats into cargo and passenger space. The Q8 can seat up to five and hold 28.6 cubic feet of cargo with the rear seats in place, which expands to 67.5 cubic feet of cargo space with the seats folded. While not quite as spacious as the Q7, the Q8 is still a versatile crossover. Pricing for the Q8 Premium starts at $68,395 (all prices include the $995 destination charge). Standard exterior features include 20-inch wheels, full LED headlights, LED taillights, a power tailgate, and a roof spoiler. On the inside, the Q8 comes with three-zone automatic climate control, an auto-dimming rearview mirror, a panoramic sunroof, leather upholstery, ambient interior lighting, heated front seats, Audi's virtual cockpit with a 12.3-inch LCD digital instrument cluster, navigation, a dual display system with a 10.1-inch upper display and an 8.6-inch lower display, Apple CarPlay and Android Auto compatibility, and a 10-speaker audio system. The Convenience Package ($850) adds wireless charging, rear cross-traffic alert, heated exterior mirrors, auto-dimming exterior mirrors, Audi pre sense rear, and vehicle exit warning. The Cold Weather Package ($600) includes heated rear seats and a heated steering wheel, while the Towing Package ($650) ups the towing capacity to 7,700 pounds. The Premium Plus trim is priced at $72,395 and adds a Bang and Olufsen 17-speaker audio system, advanced keyless start, high-beam assist, a surround-view camera system, rear cross-traffic alert, Audi side assist, Audi pre sense rear, vehicle exit warning, 21-inch wheels, auto-dimming and heated exterior mirrors, four-zone automatic climate control, perforated leather upholstery, heated and ventilated front seats, and illuminated aluminum door sill inlays as standard. The Year One Package ($2,250) adds red brake calipers, 22-inch wheels, black exterior trim pieces, S line illuminated door sills, S line fender badges, and S line bumpers. The Driver Assistance Package ($2,750) includes traffic sign recognition, active lane assist, adaptive cruise control, traffic jam assist, intersection assist, and turn assist. Adding the Adaptive Chassis Package ($2,750) brings an adaptive air suspension and four-wheel steering. Standalone options include HD matrix-design LED headlights package ($1,200) and red brake calipers ($400). The Cold Weather and Towing Packages return unchanged. Pricing for the range-topping Prestige trim starts at $77,545 and brings adaptive cruise control, traffic jam assist, intersection assist, turn assist, Audi active lane assist with emergency assist, traffic sign recognition, HD Matrix-Design LED headlights, LED taillights with dynamic animation, headlight washers, power soft-closing doors, aluminum-optic control buttons, rear side window sunshades, a leather dashboard with contrast stitching as part of the vehicle's standard equipment. The Year One, Cold Weather, Adaptive Chassis, and Towing Packages cost the same and add the same features as on lower trims. Adding night vision with pedestrian detection costs $2,500, while a Bang and Olufsen 23-speaker advanced sound system is priced at $5,000. 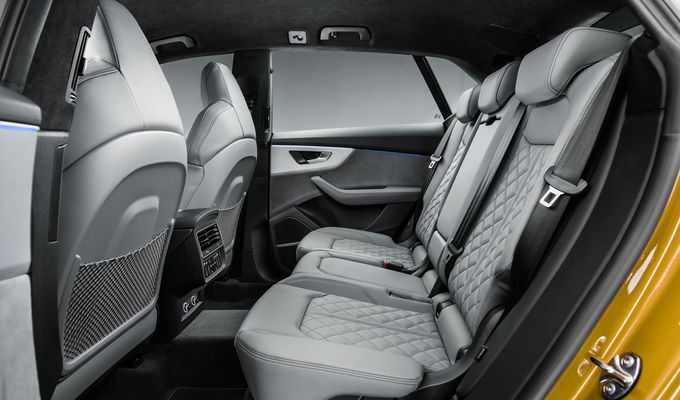 Lastly, the Luxury Package ($5,950) includes a light Alcantara headliner, dual pane glass, ventilated individual contour seats with a front massage function, extended leather on the center console and door armrests, a memory function for the passenger seat, and Valcona leather upholstery. With a starting price tag that's larger than any of the automaker's other SUVs, going with the base 2019 Audi Q8 Premium trim is what we recommend. And it's not like you're compromising on features, as the trim is handsomely equipped with a good list of standard equipment. It's surprising to see that heated rear seats aren't standard, so we'd add the Cold Weather and the Convenience Packages, the latter of which adds a good amount of safety features. Edgy, yet conservative. 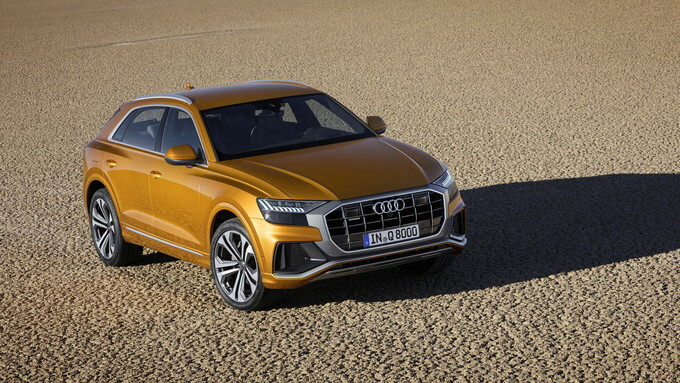 Though it sits atop Audi’s nomenclature numerically, the 2019 Audi Q8 isn't the brand’s largest SUV. It’s one of a growing new breed: the SUV-coupe. If that sounds like a paradox, to some extent it is – the usual recipe is to take an SUV, chop off cargo space, and add to the price. But the success of cars like the BMW X6, Mercedes-Benz GLE-Class, and Land Rover Range Rover Evoque has shown that the genre is here to stay. The Q8 doesn’t take the look quite as far as its German counterparts. The roofline is more rakish than the Q7’s, but it’s a gentler and less confusing look than the polarizing X6. As a bonus, it cuts into head room and cargo space less. That’s not to say the Q8 isn’t attractive. A smooth hood, an imposing face, and thoughtful creases add up to a look that’s unusual but not off-putting. The Q8 manages to be both sporty and restrained, which aligns nicely with Audi’s ethos. Comfort, not speed. On paper, the Q8 looks like a stormer. A 3.0-liter turbocharged V6 will send the car from zero to 60 mph in just 5.6 seconds. But lower down the page is the number that really matters: 5,004 pounds, the Q8’s weight. This means it's more inertia than agility. But what the Q8 lacks in finesse it makes up for in comfort. Smooth steering is matched by a buttery ride, which only improves with the optional air suspension. Add it along with acoustic glass for a level of serenity unmatched in the competition. Just steer clear of the huge rims, which stiffen the ride. Less family, more friends. The biggest difference between the Q7 and the Q8 is the Q8’s lack of a third row. The lower roofline would cut into head room. The upside is that the Q8 takes its luxury mission seriously for the two remaining rows. The Q8 gains two inches of leg room on the Q7, and it’s up nearly five on the X6. Cargo room leads the class as well, with 30.5 cubic feet behind the rear seats. All the seats are supportive enough for road trips and large enough for your tallest friends. Leather upholstery is standard, and top trims get heated, cooled, and massage-capable front seats. This may not be as capable a family hauler, but as a luxury adventurer, it’s well suited. Modern in all but mileage. As the top-dog crossover for a brand that prides itself on technology, the Q8 is appropriately futuristic. The driver gets info from a gorgeous 12.3-inch digital instrument cluster. The dash has two touchscreens, one running Audi’s crisp and responsive MMI infotainment system, the other controlling vehicle functions like temperature and safety. Apple CarPlay and Android Auto can run through a sophisticated wireless system. Speaking of safety, the Q8 gets standard automatic emergency braking. Spend-up options include the rest of the safety features you’d expect, plus some you don’t – like an automatic call to first responders after an accident. Our one gripe here is that rear side impact airbags remain optional. But the only real anachronism on the Q8 is its fuel economy. The EPA estimates that the V6 engine will do just 17 miles per gallon city, 22 mpg highway, and 19 combined. Both the X6 and the GLE-Class will do better, albeit not by much. Even the Q7, with its 21 mpg combined, is thriftier than the Q8. Final thoughts. Like it’s mongo-coupe brethren, the 2019 Audi Q8 remains a lifestyle choice as much as a utility vehicle. This is a vehicle that lets everyone know you have the money to buy an Audi SUV without worrying about practicality. But unlike the likes of the X6, the Audi makes a more sensible argument. It’s less polarizing and offers more room to stretch out in the second row. It’s attractive, but it’s less about look-at-me styling than it is comfort and curation. And comfort it has in spades, along with enough tech for the most modern of drivers. The Q8 is exactly what you’d expect of Audi’s take on the SUV-coupe – and that’s not a bad thing. We have partnered with trusted dealers in your area to give you a great price on the new Audi Q8.